A new rouge with rich, lasting shine, vivid color payoff, and the effects of a concealer. Glow shine ingredients create a glossy shine and moist touch. In addition, the “vivid color gel coat ingredients” create an intense color while simultaneously correcting any dullness and uneven color on your lips. 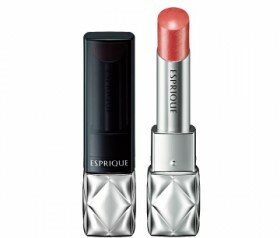 Spread the rouge across the plump part of the bottom lip. Draw an outline around the top and bottom lips with the tip of the rouge.